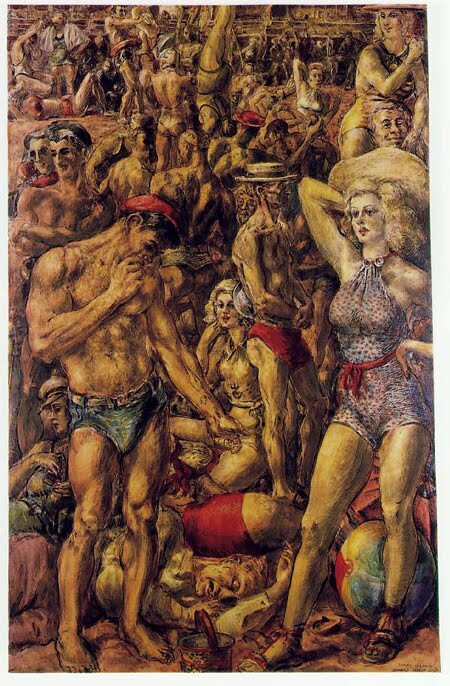 Best known for his drawings and paintings of crowds at Coney Island’s beach, artist Reginald Marsh also took photos with a 35mm Leica beginning in 1938. These images from the 1930’s and ’40s by Marsh are from a portfolio of 50 photographs of New York City published in 1977, which is currently offered for sale. The limited edition of 25, plus four artist proof sets, were printed from the original negatives with the provision that the negatives could not be used for any further publication. “The sets are very rare,” photography dealer Jeffrey Kraus of Antique Photographics, told ATZ. “I sold one a number of years ago and this is the second set I am offering.” The portfolio is available for $6500. Marsh was also drawn to the front of the shows, where people stood entranced by the talkers, and the whirl of rides like the carousel and the Virginia Reel, which also attracted onlookers. The Virginia Reel was invented by Henry Elmer Riehl, who named the ride after his daughter, Luna Virginia Riehl. Originally in Luna Park, it later operated at Bowery and West 12th Street as part of Kyrimes Park, where it shared a lot with such now vanished rides as the Gyro Globe, the Looper and the Whip. Back in the day, there were more independently owned rides and attractions and all had their own distinctively-lettered, open-air ticket booths. The only ride in Coney Island that exists today with its original ticket booth is the Wonder Wheel. Like the Wheel, the ticket booth was built in 1920. The Virginia Reel, my personal favorite. photos directly informed some of his paintings. Thanks Tricia, one of my all time favorite posts. Wish I was there. Here’s one of Marsh’s Coney Island paintings….